Vinyl lettering is a ready to apply, self-adhesive lettering. Custom Vinyl lettering comes in pre-spaced words or phrases as you desire. All Printing is printed in High Quality. This is great for advertisement on windows, cars or even for your home! When you are looking for a creative way to advertise and promote your business, one of the best tools is Vinyl lettering. This type of lettering is easy to use and can be installed almost anywhere that you want to show off your business. One ingenious way to spread the word about your local business is to get your business vehicles branded with important information about your business. Business owners can custom craft their own self-adhesive lettering with Design One Printing’s help, that can be safely applied to their business cars, trucks or service vehicles. Whenever you or one of your authorized employees drives around town, fellow motorists see your ad. For maximum impact, be sure to get a customized decal for both the driver and passenger side, and one for the rear of your vehicles. If you do not prefer to put vinyl lettering directly on your vehicles, another option is to order lettering that can be installed on the back window of your car. If you use a trailer for your business, trailer lettering is a great way to brand your venture. 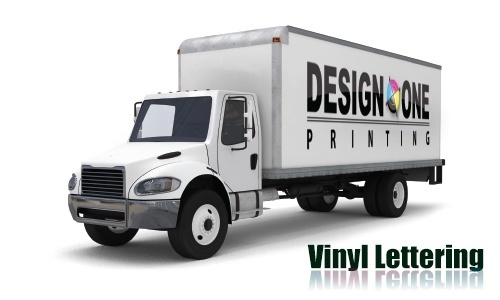 No matter whether you are running a food truck, animal transportation services, hauling services or a concession stand, you can use vinyl lettering to let people know about the products you sell, your business name, your website address, phone number and other pertinent information. When you are traveling people can not help but notice your food truck, concession stand or trailer. When you display your business information while you are working or on the road, it helps people recognize you quickly and buy from you. In the event that your business needs signage, vinyl lettering is a great option to create a professional looking sign without paying an expensive signmaker. Optionally, business owners are able to upload their logo or graphics to incorporate it in their vinyl lettering. Even if you do not own a business, you can use lettering on a signpost outside of your home, on your boat, motorcycle, watercraft or on your mailbox. If you have a need for lettering, there is a solution for you. There is no doubt that image is important for every business in operation today. Advertising, marketing, and promotions are key to building your business. If your line of business requires you or your employees to drive around town, there is no reason not to invest in some branding for your business vehicles. You will be surprised at just how much new and repeat business you will get from this strategic advertising approach. Design Your Custom Lettering Decals with our Help! No matter whether you want classic style lettering, handwritten style lettering or a funky font to represent your business, you can find one to suit you. Common fonts include Serif, Sans-Serif, Script, Heavy (Bold) fonts, Small Caps, Artistic fonts and many others. Business owners can choose from several different colors of vinyl, including black, white, red, gold, yellow, green, blue, silver and more. For a more dramatic effect, the use of shadows and borders help add depth to your lettering. Special effects like curves, arches, cascades, fades, rings, and slants, just to name a few. When you choose to design your own vinyl letter signs and decals, you can let your creative mind go wild! If you do not feel comfortable doing your design yourself, you are welcome to contact a salesperson and have them work with you to create a great design that works well in your space. Don’t wait another minute to get your vinyl lettering for your personal or professional use.